Kingdom Investment Ministry was birth into the heart of Prophet James Murphy, JR. on an international mission trip to Africa. The time spent away from every possible distraction, he heard the voice of God giving him instructions to begin a work to grow his ministry. After servicing as an Evangelist and Elder at Bride Temple Church of God for seventeen years under the leadership of Bishop S.U. Anderson, he step into the path God led him. He begins with a Bible Study at Park Trace Community Center. The group begins to grow and required more. Pastor James Murphy with the support of his Bishop begins to have a Sunday morning service once a month. God led the ministry to make a difference in the community along with preaching and teaching the gospel of Jesus Christ. We are committed to serving outside of the four walls, and continue with our various outreach ministries. We realized God has greater plans and the mandates for the body at K.I.M., as God spoke them to leadership, we obeyed. We begin to look for another location to accommodate the growth of the church. 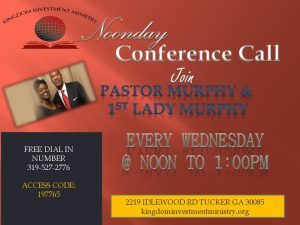 After a year of diligently searching God lead us to 2219 Idlewood Road, Tucker, Ga. The church has continued to make a difference, we house several ministries.